lo llevamos a cinco ! "sin conexión" a Internet !! 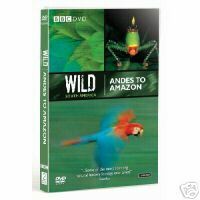 An exploration of the exciting, diverse and unique wildlife that inhabits the dramatic landscapes of the vast South American continent. It is a land of great extremes, stretching from the Antarctic to the Equator. It has the planet's greatest river system, longest mountain chain, biggest and richest rainforest and driest desert. Using the latest camera techniques, including infrared night vision cameras, rarely seen animals are revealed, whilst a specialist aerial cameraman soars over the continent, revealing an entirely new perspective on its varied and dramatic landscape. de descuento en la compra de tu SIM para viajar !